This effective multi-purpose oil is one of Donna Eden’s favorites, when her own M.S symptoms arise! Many benefits for your skin, health and it will awaken your nerves! Very helpful for autoimmune illness – but always energy test this! Gently awakens your nerves creating a sense of vitality and well-being. 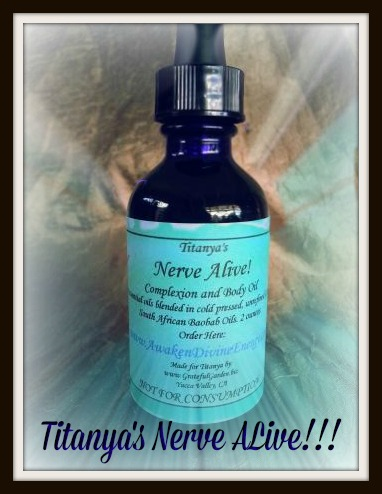 Titanya had used this when she was having a difficulty with numbness in her arms. She was always quickly surprised, when this oil relieved her symptoms within 5 minutes! People have also said that it works great on people who bruise easily. And to top it off it is relaxing! Ingredients: Vitis vinifera (grapeseed), Simmondsia chinensis (Jojoba), Adansonia Digitata (Baobab), Lavandula Angustifolia (Lavender), Citrus Aurantium var. Amara (Neroli).